Piety loss that drops piety below zero from multiple sources in one frame will no longer cause multiple punishments. Fixed a bug where the radial menu would appear in odd locations in smaller layouts. Fixed a bug where buttons in the god-menu weren’t showing a mouseover state. Added ‘Off’ option to mouse drag mode setting. Revamped the menu. Adding settings sliders and quest information. Extra conversion after converting an item from the ground no longer possible. Small inventory items can now be dragged onto empty small slots once again. Fixed a crash bug that could occur when casting at certain distances. Fixed a bug when defeating selected reviving enemies. 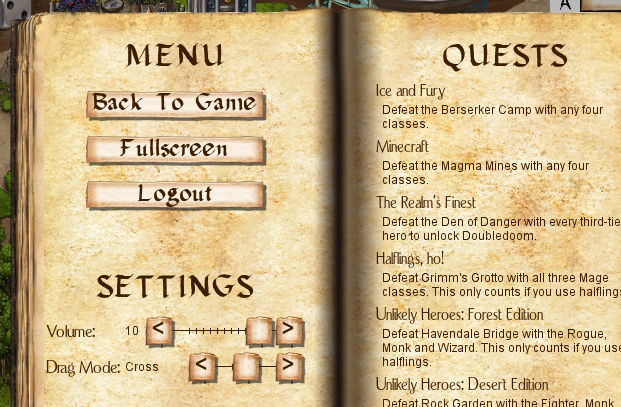 Fixed a bug where selecting last run with monster classes and quests could stop the ‘play’ button from lighting up. Dragging items off inventory no longer leaves dangling states.